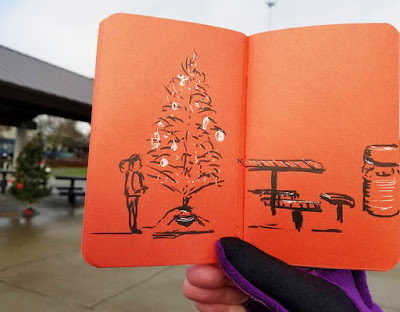 Three years ago when I made the commitment to sketch every day, I had hoped that developing a daily drawing habit would improve my skills, and I think that’s been true over the long haul. Some days I still make sketches that look like I’ve set myself back a couple of years, but then the next day I’m back at my usual place. I’ve been at this sketching thing for more than five years, and I’m progressing at a much slower rate now than I used to. It’s not as exciting as it used to be when I saw regular improvement, which is such a built-in reward. On the other hand, I’m more motivated than ever to keep going because I know I’ve come so far since I began. I’ve accepted that it’s inevitable to see the most rapid improvements in the beginning, and after that the changes are more gradual and incremental. I’m no longer afraid that I will hit the dreaded plateau of never seeing any improvements ever again. I believe that as long as I continue to make conscious efforts to actively learn from my practice, I will continue to grow, even if growth is not always visible day to day. 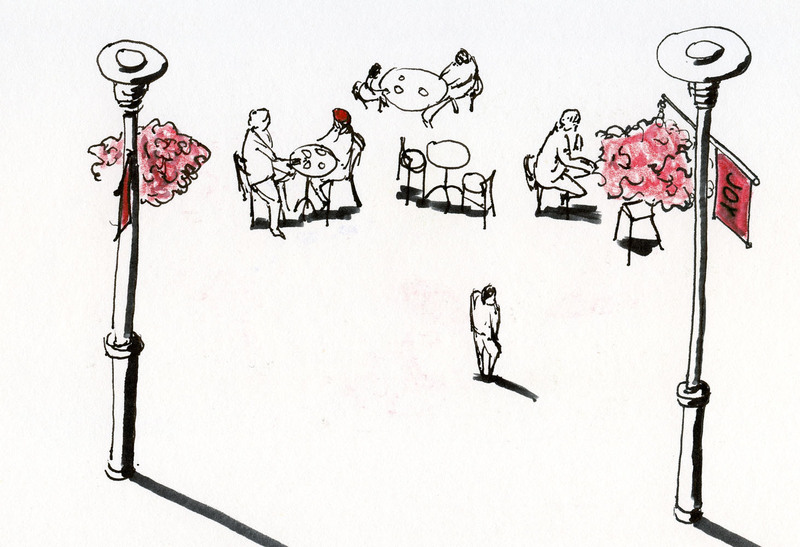 Mind you, sketching daily doesn’t make sketching easier. Every sketch has its own challenges, and I’ve never actually made a sketch I could say was “easy.” But with practice it takes less mental muddling and confusion to figure out how to approach a sketch, so at least that part feels less daunting. Whenever I set out to sketch, I enjoy the whole process: choosing the subject matter, composing the scene, deciding which materials and tools to use, and finally completing the sketch. But one thing that is hardly ever part of my process is getting inspired. (I admit I’m inspired quite a bit when I travel, but at home in familiar territory, it’s much harder.) As you can see from the examples here, nothing is inherently inspiring about a shallot, recycle bins or a lamp post (I was waiting for Greg to return from the men’s room at the mall when I made the latter – my “inspiration” was five minutes to kill). Nothing is special about the subject matter of most of my sketches – yet the act of sketching makes it special to me in that moment. It’s as if the inspiration is retroactive. 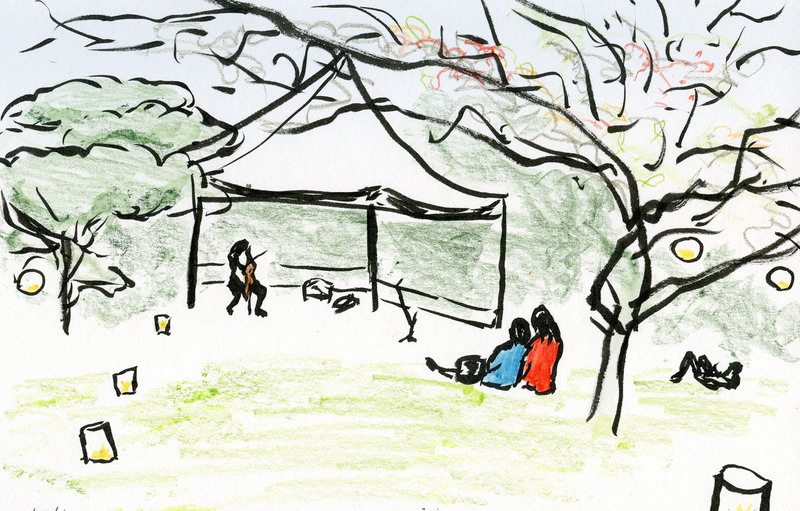 Sometimes I hear other sketchers (or would-be sketchers) say that they want to draw, but actually sitting down or going out to do it – making the choice to do it – is the difficult part. There are always other things more urgent in our lives that we are obligated to get on with. Conversely, there are always less important things that call to us more seductively. (Maybe I’ll draw now. . . hey, someone just commented on my Facebook post! I’ll take a quick peek. . . ) And I’m sure that the longer it’s been since the last sketch, the harder it is to make the next one. Over time, I’ve come to learn that while drawing every day has benefits in terms of generally improving my skills, the far more valuable benefit is this: Every sketch I make makes it easier to make the next sketch. Today’s sketch always makes it easier to make tomorrow’s sketch. And that’s as good a reason as any to sketch every day. Happy sketching to all of us in 2017! You know Christmas is over when the large tree in Pioneer Square comes down. 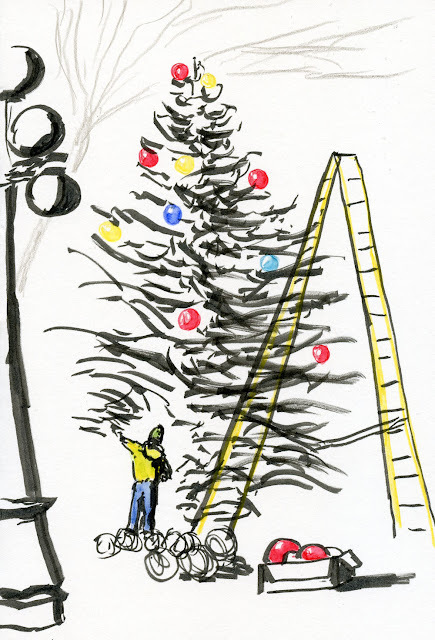 Meeting with Urban Sketchers Seattle for the last time of the year, feeling a bit wistful as I always do when I know the holiday season is coming to an end, I sketched the workers cutting off the branches and taking down the shiny ornaments. 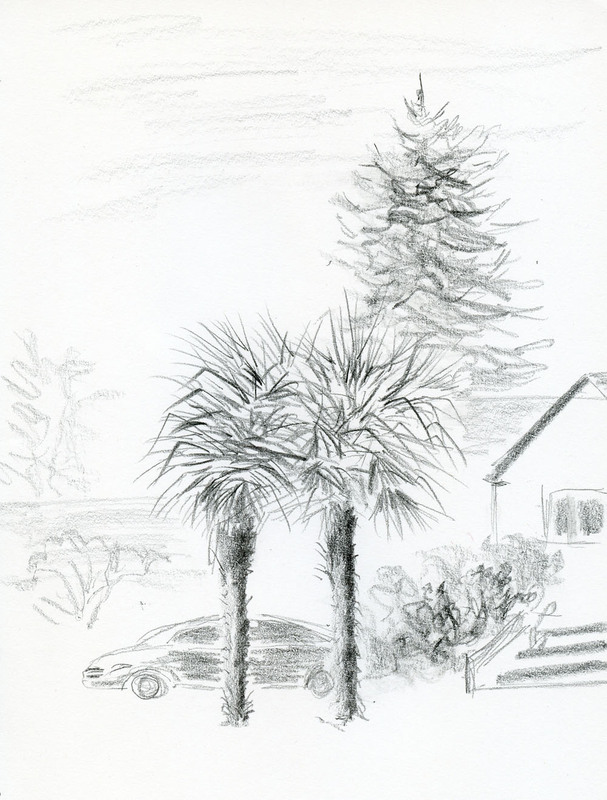 On the other hand, I was thrilled to be able to sketch outdoors, however briefly. 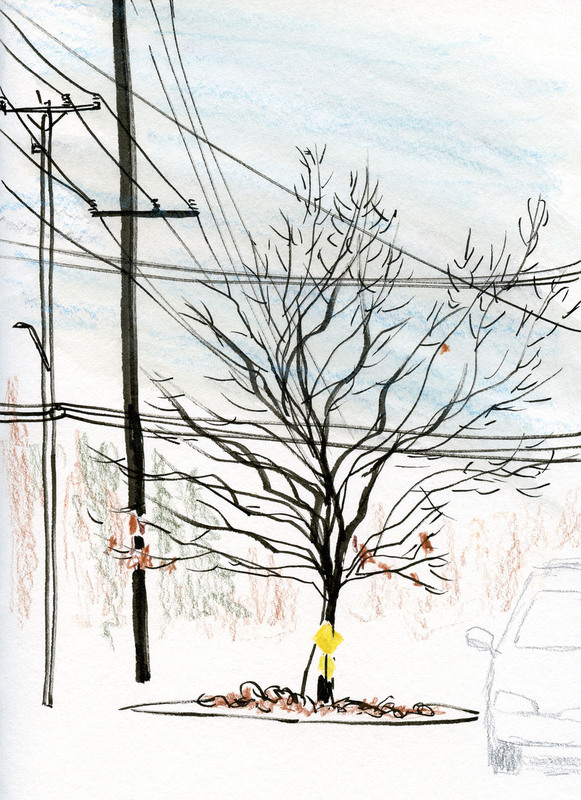 Although I didn’t paint it into my sketch, a large part of the sky was actually blue this morning! After 20 minutes in 40 degrees, I retreated to the warmth and pastries of Grand Central Arcade. 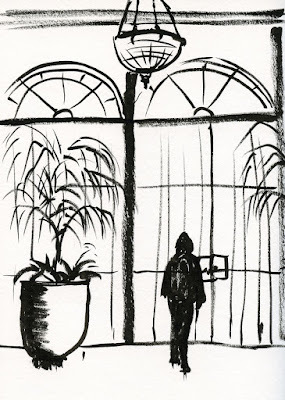 While I enjoyed sketching a silhouette of the main entrance and its beautiful arched windows, and while the cinnamon roll from Grand Central Bakery was as delicious as ever, I was again struck with some sadness about how the Arcade seemed dark, somber and empty. When I worked downtown decades ago, the Arcade was a favorite lunch break getaway (I already had my nostalgia fest the last time we sketched there), and it was full of interesting shops; its many tables were always crowded with people. Today there were more “for lease” signs than occupied spaces, and the homeless seemed to outnumber the employed (though not the sketchers). Finally, my third reason for melancholy today was that we had to say good-bye to Ching, who is moving to the Bay Area. She’s been a very regular, enthusiastic urban sketcher the past seven months, and we’re all going to miss her. 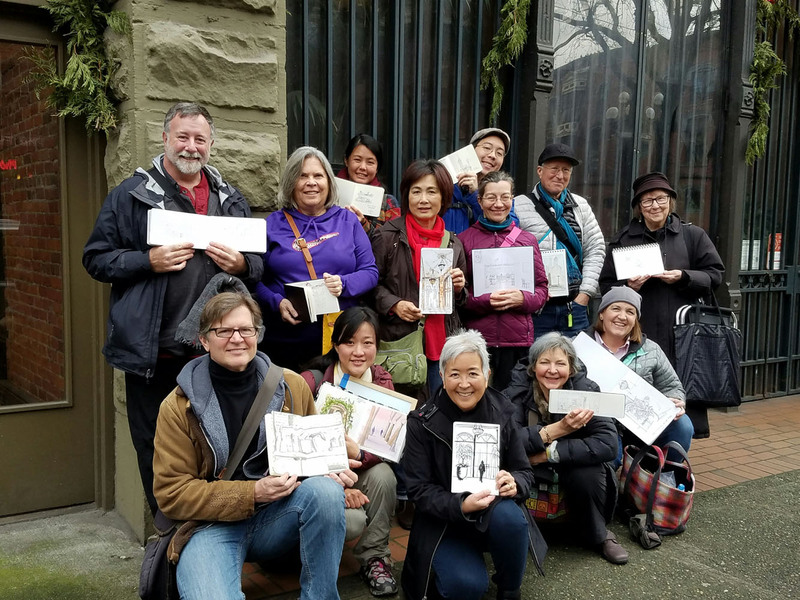 We'll miss you, Ching (second from left, front row)! 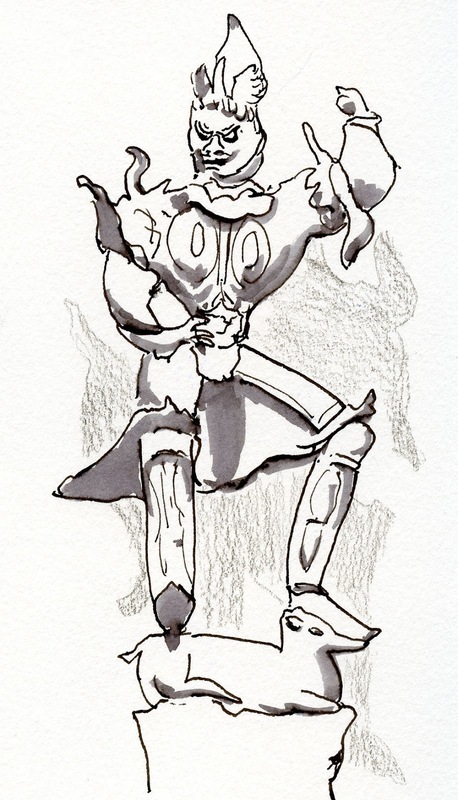 Here are links to my most memorable sketches of 2015, 2014 and 2013. 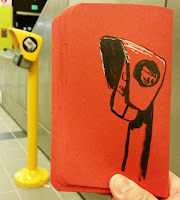 March 28, light rail card reader, Capitol Hill Station, Seattle (right): Something about the small, ephemeral form of my first Field Notes Sweet Tooth notebook invited me to make this uninspired sketch and gave me a new attitude about sketching. May 26, still life (left): This was one of the first still life sketches I made in colored pencil. 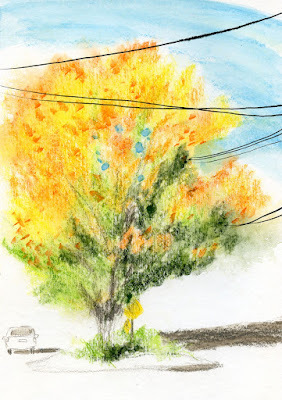 I hadn’t yet fully embraced my love for colored pencils to the point of removing watercolors from my sketch kit, but I was working up to it. 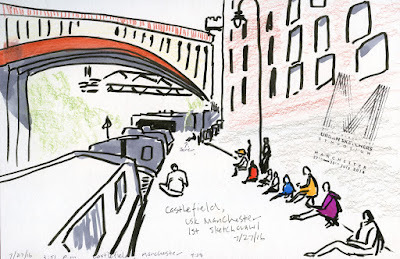 July 27, Castlefield, Manchester, England (below): The Urban Sketchers Symposium had just begun, and this was my first sketch as a correspondent – a role I had been dreaming of for a long time. Seeing sketchers from all over the world gathered there made me feel like I had come back home to my tribe again. Aug. 9, River Avon, Bath, England (above): Compared to non-stop sketching in Manchester or the intense crowds and noise of London, Bath was heaven. It was all about rest, relaxation and taking all the time I wanted for a sketch. 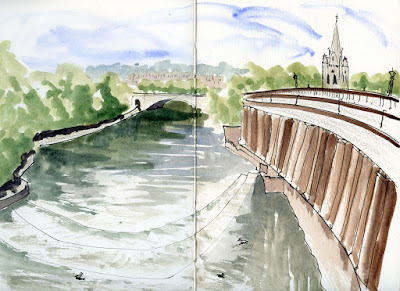 This one was done through the window of a coffee shop built right into the Pulteney Bridge overlooking the River Avon. 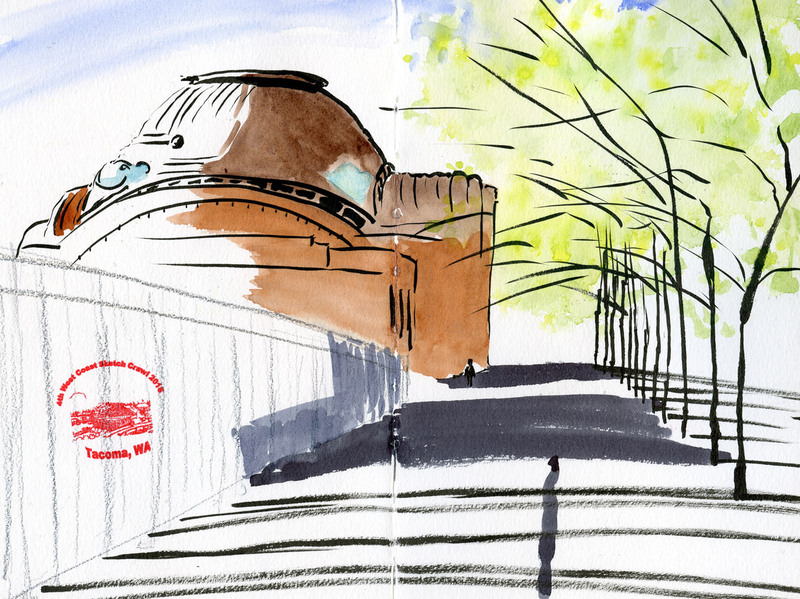 Aug. 20, Washington State History Museum, Tacoma (right): During a record-breaking heatwave, the West Coast Sketchcrawl literally sizzled! Afraid that I’d be baked and roasted by afternoon, I got started early in the day and plunked myself down in the still-comfortable shade. Aug. 27, Minnesota State Fair, St. Paul (left): After years of wanting to sketch at the Minnesota State Fair, I finally got my opportunity – and joined the Twin Cities Urban Sketchers for their annual sketchout! Sept. 17, Japanese Garden, Seattle (right): We had missed the event several years in a row, so our anticipation was high – a serene autumn evening in the Japanese Garden, watching the Harvest Moon rise. Alas, it was not to be – heavy clouds that eventually opened up with rain kept the moon from our view. 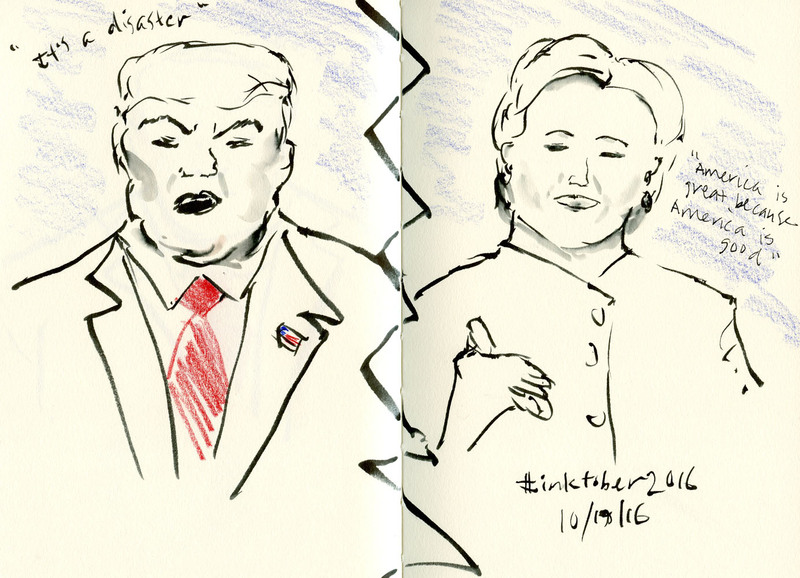 Oct. 19, televised presidential debate (left): “Prepping” for the following day’s medical procedure, I spent the evening viewing – and sketching – the debate on my laptop in the bathroom. ‘Nuff said. Oct. 31, InkTober completion (below): The month-long InkTober challenge gave me an opportunity to do something I’d been wanting to do for a long time but couldn’t seem to get started on – making cartoon-like sketches from imagination. Somewhere along the way, Weather Bunny emerged – and still lives on! 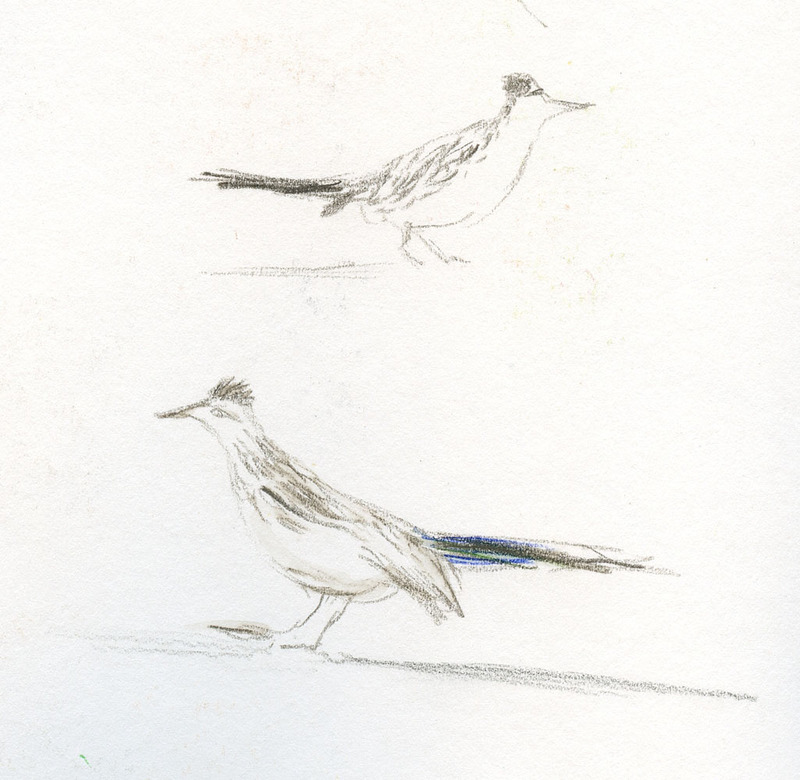 Nov. 15, roadrunner, Joshua Tree National Park (below): We saw amazing rock formations and vegetation in the desert, but the most fun I had at Joshua Tree National Park was chasing a roadrunner around the visitor center’s parking lot! 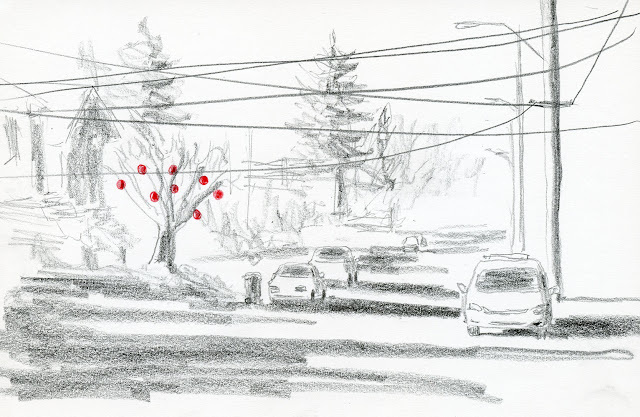 We had a white Christmas in Seattle – but not from snow. All morning the landscape was hidden behind a thick veil of fog. 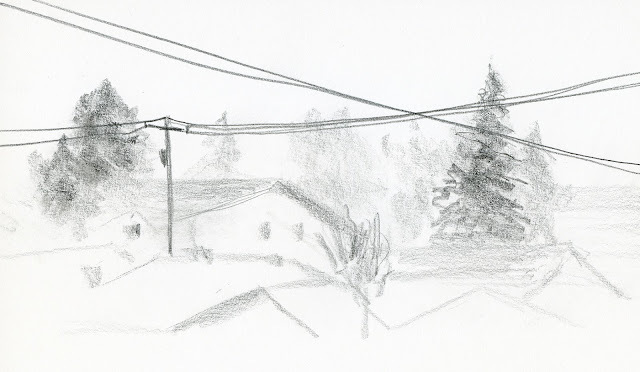 I’m hardly ever inspired to sketch from my front window because the rooftops and trees are so familiar to me, but the fog gave everything a layer of mystery. Yesterday morning wasn’t quite as foggy, but the overcast sky was gray and foreboding, and the air wrapped around me like a cold wet towel. Coming home after an errand, I drove through the Ravenna neighborhood and spotted these Chinese pinwheel palms that gave me the perception of warmth. Graphite seems made for this dark and colorless time of year. 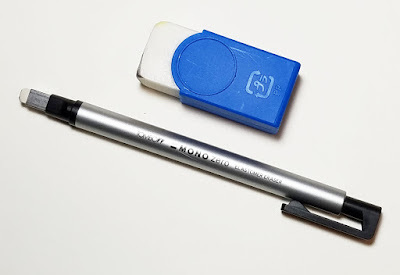 The other day an Instagram friend and blog reader asked if my recent use of graphite had tempted me to use an eraser. After all, graphite is the one sketching medium that can be erased easily. I thought it was an interesting question, so after replying to her, I decided to respond here, too. 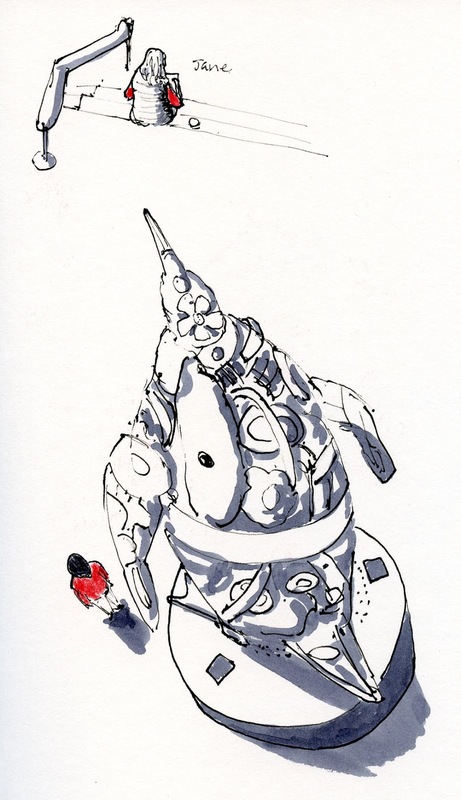 When I was taking part in InkTober, I had the impression that many InkTober participants used the event to wean themselves of eraser use – a challenge to face the indelibility of ink. Maybe I’m somewhat unusual, but I went straight to ink almost immediately after I began sketching, so I didn’t go through the eraser dependence that many sketchers apparently do. Indeed, even as a stark beginner, I realized that I saved a lot of time (and spared the paper surface that gets degraded from erasing) by skipping the pencil draft and going directly to ink. Now that I’ve been dabbling in graphite more, I don’t think about the fact that it can be erased. I use a pencil the same way I use ink. When I make a line I regret, I simply restate it, and usually the shading that eventually follows will make the unintended line disappear. If not, it’s just a part of the sketch, just as all my ink lines are. However – I recently discovered a hidden talent of erasers that had not occurred to me before. (I’m sure this is common knowledge among graphite artists, but I guess I don’t read enough books by them to learn this the easy way!) 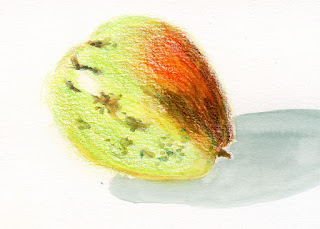 A few weeks ago I was sketching a Comice pear and realized toward the end that I’d forgotten to save out the highlight. I was doubtful whether an eraser would be able to cleanly delete colored pencil, which is notoriously difficult to erase, but I tried it. To my surprise and delight, the color came out cleanly. I used a white plastic foam eraser (shown in the blue holder in the photo) that had come with a box of Uni Mitsubishi colored pencils, so I’m guessing it’s made by Mitsubishi (though it has no branding information). Last week when I was using graphite to sketch a dumpling squash, I remembered to save out highlights, but after shading it, I felt like the highlights had gotten lost. I was afraid the corners of the eraser I’d used previously were too worn down to be able to get a sharp erasure in small areas. I needed a smaller, sharper eraser. That’s when I remembered the Tombow Mono Zero Elastomer eraser that I had received as a gift a couple of years ago. It took me a while to find it, but it turned out to be perfect. It has a tiny rectangular erasing surface, so the corners and edges are small enough to put in the highlights easily. Erasers aren’t just for mistakes; they are, in fact, for intentions! Weather Bunny and I wish you all a joyous holiday season! I love getting to this part of the season when all the work is done, and there’s nothing left to do but enjoy the holidays. 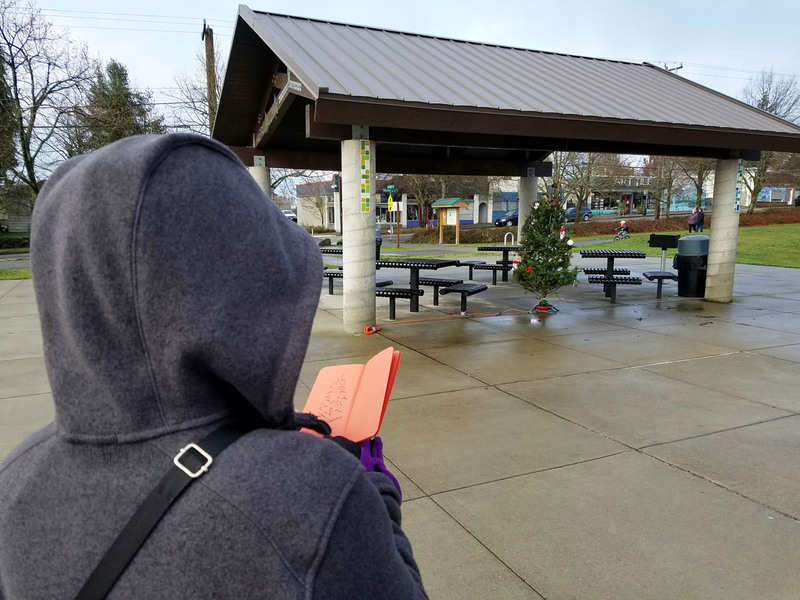 We took a chilly walk to Maple Leaf Park this morning, where some neighbors had put up a small but festive Christmas tree under a shelter. It’s the end of December, which means it’s time for the fifth annual roundup of my Top 10 sketching products of 2016! The series is always among my most-read posts every year. It’s also one I look forward to writing annually because it gives me an opportunity to review and assess the materials and tools that have served me best in the past 12 months. Unlike some product roundups that include only products that were released that year, my criteria are different. 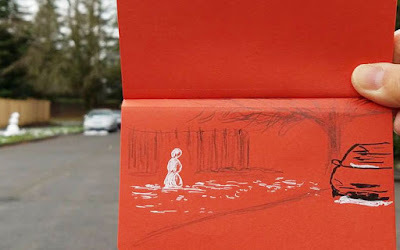 My focus is on things I use most often or that best support the way I like to sketch most – on location, often outdoors, often standing, in a limited time. Versatility, convenience and compactness are key considerations. If you’ve seen my lists from previous years, you’ll note that not much is new; no dark horses this year. A few items in the Top 10 have been there for several years (one has made it onto the list every year), but a few had to drop off to make room for others. Most notable among the drop-offs is my beautiful “Stefano” sketchbook system, which had been on the Top 10 every year prior to this one. You already know how sad I am about that, so I won’t dwell on it again. A couple of fountain pens dropped off the list – a Pilot Parallel with a modified nib (it’s still fun to use now and then, but it’s more a novelty than a mainstay) and a Pilot fountain pen with Posting nib (which was so fine that it encouraged me to be more fussy and detailed, which I’m trying to avoid). 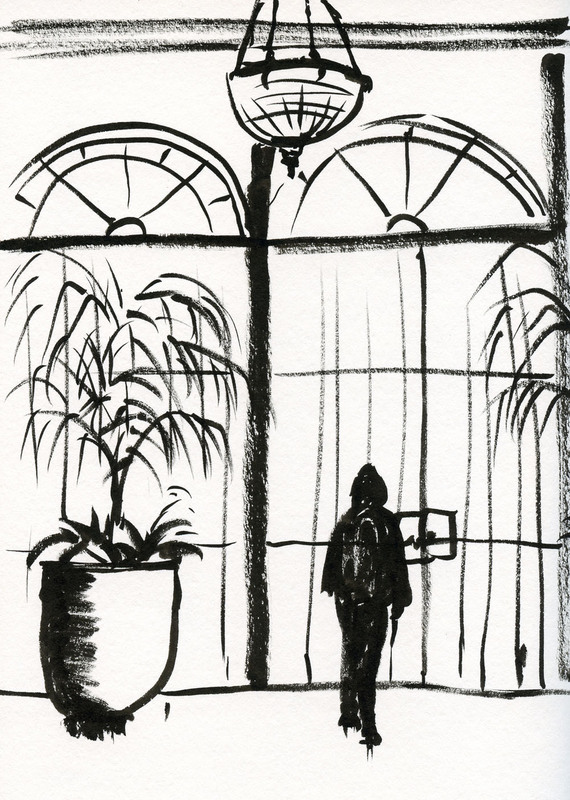 I was torn about taking ink-filled brush pens off the list, as I still use them regularly when I need a fast swipe of sky or shadow. But instead of trying to use them as a substitute for watercolors as I sometimes used to, I’ve cut way back on the number I carry – I’m down to only one blue and one gray. 1. Canson XL 140-pound watercolor paper in self-made sketchbook signatures. Ever since I began binding my own sketchbooks, I’ve tried a lot of different papers. It’s always about finding a balance between cost and how well the paper’s thickness and surface meet my needs. It’s also a practical issue: I have a very small studio with no appropriate surface for cutting or tearing down large sheets. Despite features I’ve liked about other papers, I keep coming back to Canson XL 140-pound watercolor paper in a very convenient 9-by-12-inch pad. It’s a “student grade” paper, so the surface is probably not ideal for watercolor painters, and yet I’ve found it to be completely adequate for my wet media needs (including some heavy washes; see No. 9 below). And its availability in a 9-by-12-inch pad means all I have to do is pull the sheets out and fold them in half to stitch my signatures. Easy-peasy. 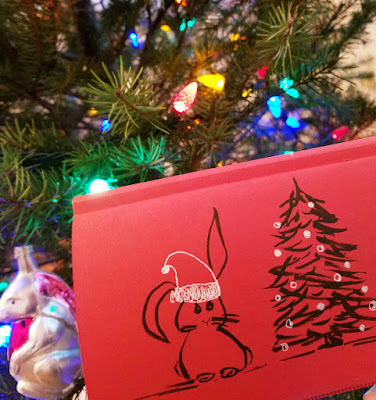 kit so that I can sketch snowmen in my red Field Notes. 2. Sakura Gelly Roll opaque white gel pen. For a long time I used a Uni-ball Signo gel pen when I needed an opaque white marker, and it worked well most of the time. But the past year I’ve been using a Gelly Roll because it pops more vibrantly on red paper (see No. 7 below) and doesn’t seem to clog as much. 4. * Platinum Carbon Black ink. This waterproof ink is the only product that has been on my Top 10 all five years. It dries almost instantly, is completely waterproof and has never clogged a pen. Whenever a new waterproof ink came out, I used to try it, wondering if it could be better. But lately I haven’t even bothered. PCB has never let me down – that’s good enough for me. a wide variety of line widths in one convenient pen. 5. * Kuretake No. 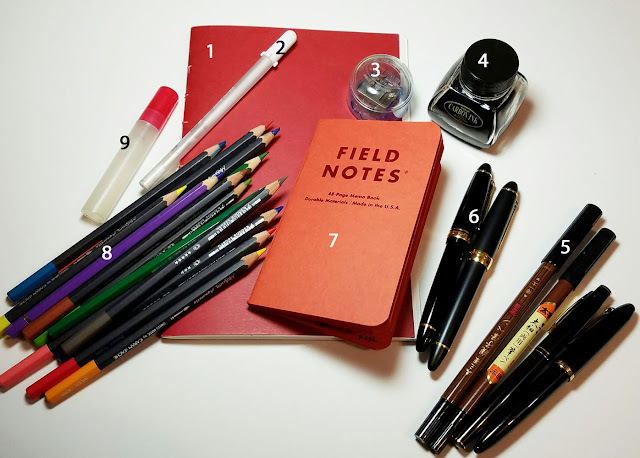 13 fountain pen style brush pen and other brush pens. 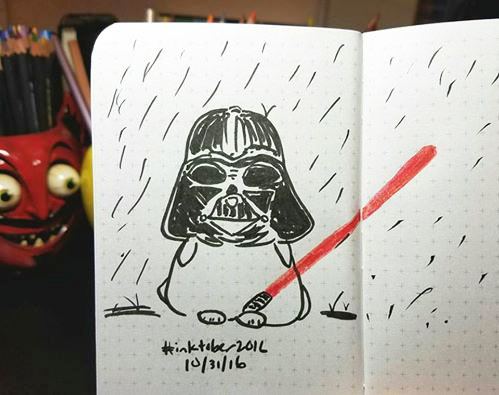 The Kuretake No. 13 appeared on my Top 10 last year for the first time, and it remains there now – although I gave myself some leeway by adding “and other brush pens.” That’s because I now regularly carry four brush pens – two with “hairy” brush tips (one with waterproof ink, one with water-soluble ink) and two with “non-hairy” felt tips (again, one waterproof ink, one water-soluble). 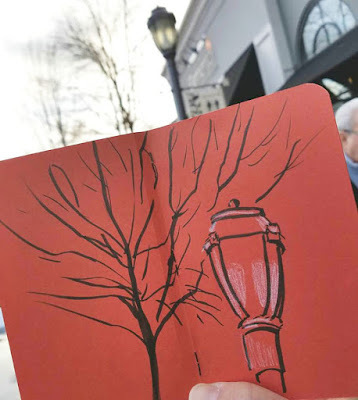 Each type of brush tip and ink type serves a different sketching purpose. I’ve tried a lot of brush pens (nearly 50! ), and although they all perform similarly, I favor both the Kuretake No.13 and the Sailor Profit because they can be refilled with standard fountain pen inks and cartridges. I wish I could find a non-hairy brush pen that could be refilled, but the problem is that felt and formed tips wear out relatively quickly, so they usually don’t last long enough to refill. lines I can get from a fountain pen. 6. * Sailor Naginata Fude de Mannen. After two years of solid use, I’m happy to say that my gold-nibbed Sailor fude fountain pen is still living up to its grail status. My only regret was that I had just one, because I always like having one pen containing waterproof ink and one containing water-soluble ink. When I heard that Sailor’s specialty nibs, especially the fude, were getting harder and harder to find because the company was so deeply back-ordered, I sprang for a second fude as soon as I found one. The two Sailor fudes are the only fountain pens I use regularly for sketching. 7. Field Notes Sweet Tooth edition. By now I have my choice of several Field Notes Brand notebook editions (they’re such an essential part of my basic sketch kit that I would take one to Gilligan’s Island). But the one that really changed my sketching life was Sweet Tooth, especially the red one. Something about its playful color – dark enough to act as a toned background – invites me to sketch the most uninspired subject matter. 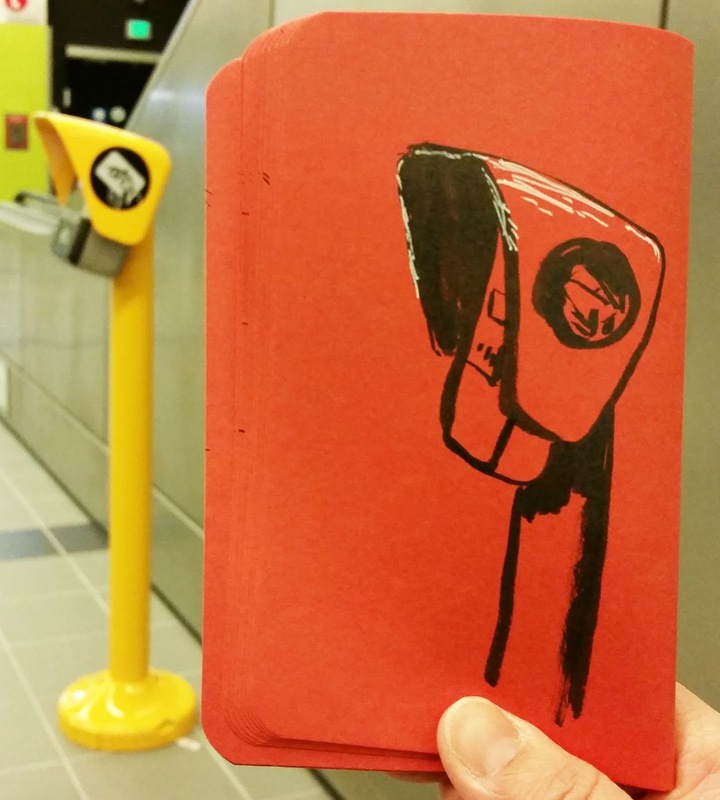 The ephemeral nature of Field Notes takes all the pressure off. As I wrote in the blog post in which I revealed my surprise that Sweet Tooth had taken hold, the notebook liberates me from expectations and lowers my standards to nothing. 8. 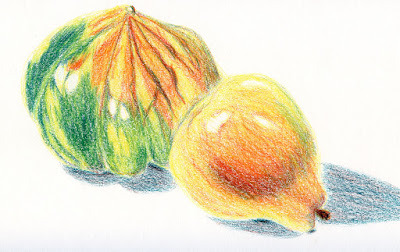 * Caran d’Ache Museum Aquarelle colored pencils (and a few other brands thrown in). Although I use a variety of watercolor pencil brands when I need certain colors, the Museum Aquarelle line is by far my favorite. They are still the softest, creamiest water-soluble pencils I’ve used, with or without the addition of water. tree a quick spritz to activate and intensify the colors. 9. Portable water spritzer. Although I’ve been carrying this little gizmo for years and use it regularly, this is its first appearance on my Top 10, and I feel like I’ve been taking it for granted. When I used watercolors, I moistened the paints before using them with this little sprayer. When I want to put a streak of blue sky in a sketch with an ink-filled waterbrush, I always give the page a spritz of water first to help spread the color more evenly. And now that I’ve been using water-soluble colored pencils as my primary coloring medium, the spritzer is handier than ever. I use it to spray the clean page when I want to use the pencils dry-on-wet. 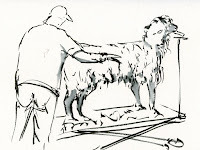 I spray the finished sketch liberally to intensify and disperse the color rapidly. (Incidentally, Canson XL 140-pound paper, item No. 1 above, can stand up to a pretty good dousing.) I’d be lost without it! I couldn’t find one exactly like mine online, but I got it at a local travel store. Intended as a purse-size perfume atomizer, it puts out a fairly fine mist. The Kutsuwa Dr. Ion organizer keeps all my implements upright in my bag! This year’s honorable mention goes to Stillman & Birn’s softcover series. If I weren’t still happily binding my own sketchbooks, the softcover version of S&B’s Beta would be my daily-carry sketchbook of choice and definitely on the Top 10. I still use Alpha, Beta and Epsilon editions regularly in my studio, though. 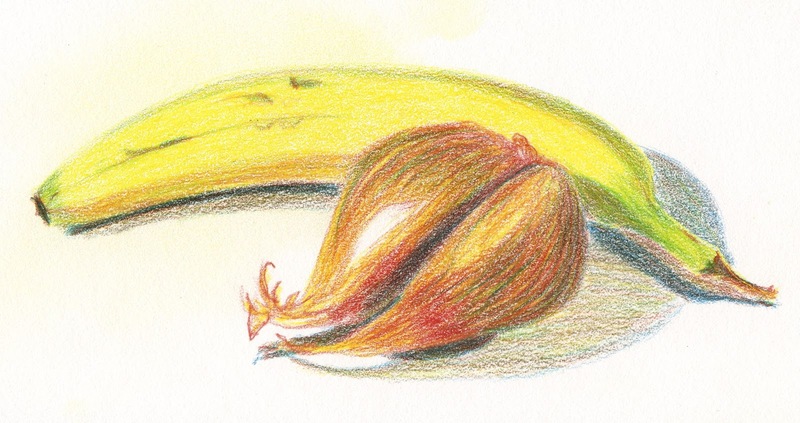 Alpha, in particular, is a favorite for those colored pencil still lifes I’ve been doing. 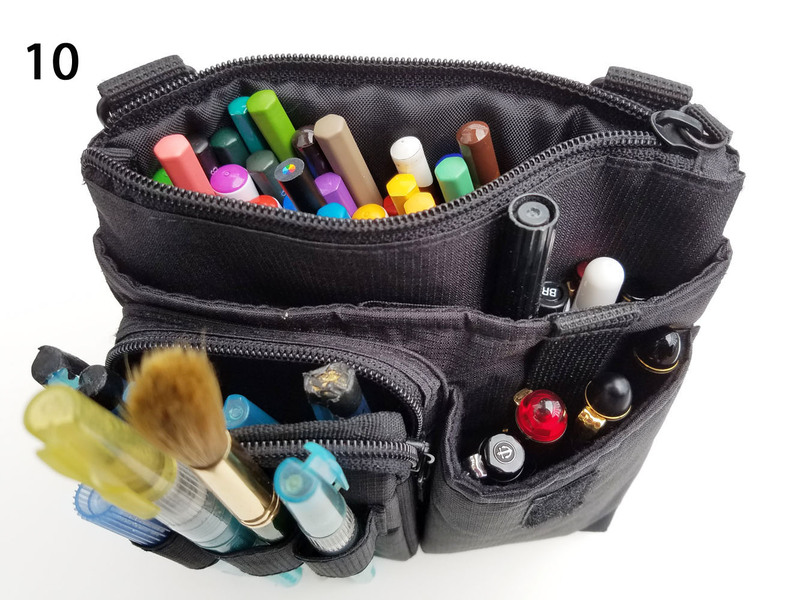 As a new part to my annual Top 10, I’m going to speculate on the changes I might make to my sketch kit by this time next year. Right now I can’t imagine anything that would drop off the list (but I always feel that way). 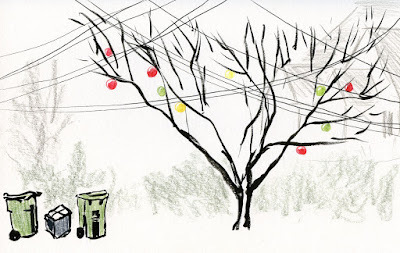 I’m wondering, though, whether a graphite pencil might appear next year – or is it just a temporary novelty during these colorless winter months? 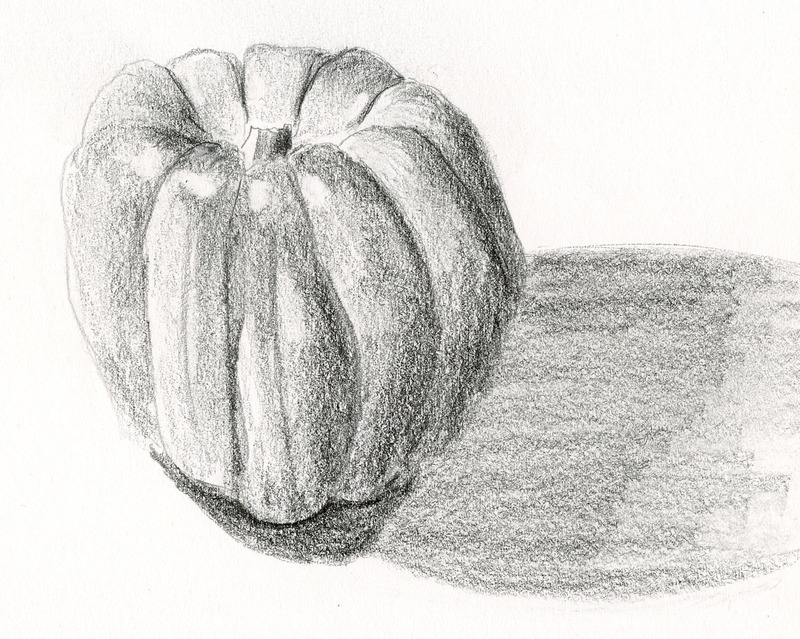 I’m also really enjoying using pencil with a Baron Fig notebook – is it Top 10-worthy? Time will tell. It was noon, but the shadows looked more like 4 p.m. 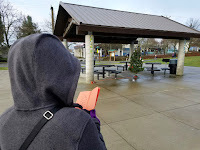 Despite the cold, I was grateful to see shadows at all – it’s been wet, dark and dreary for a while, and rain is back tomorrow. Happy Solstice! Thankfully, the days can’t get any shorter. 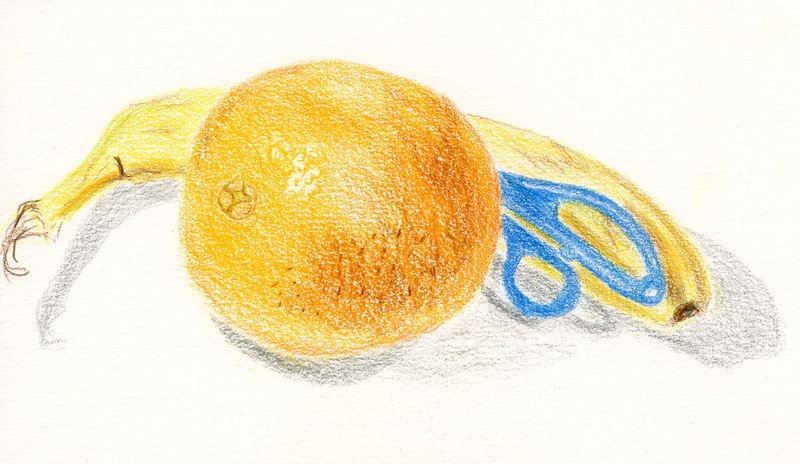 A couple of weeks ago I got the idea to severely limit my colored pencil palette with a still life. 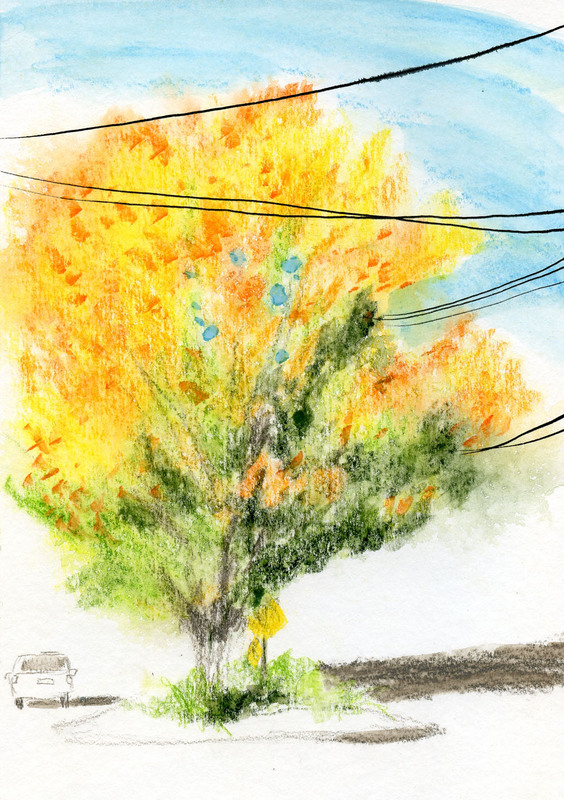 That day I used only five pencils – a drastic cut from the 10 to 20 colors I usually chose. Now I’m down to three primary colors. I showed you the apple I sketched last week in my review of the Baron Fig notebook. Here are a couple more of (you guessed it) Comice pears and a carnival squash. In each case I used only three pencils. When I allow myself to have as many hues as I want, my tactic is to find pencils that come as close as possible to the full range of colors I see – that’s how I end up with as many as 20. When I use a primary palette, I select a red, a yellow and a blue that are somewhat close to the hues I need to blend them into, not necessarily what I see. For example, the carnival squash has streaks of dark green, so I chose malachite for the blue, which has some green already in it. I chose a red-orange for the red, since the squash and the pear both have orange in them. I always make a test scribble on the side so I can see what kinds of grays or browns I can get with the three before I start (at left). Once I commit to the three, that’s all I use. I’m guessing this is a similar process to what painters use to mix colors, and I think I’ve learned that process from books I’ve read on watercolor painting. Yet somehow I find the process easier with pencils. 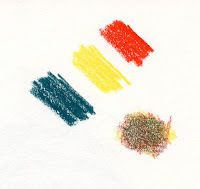 Maybe it’s just that the hues I see on the pencil points are very close to what I’ll see on paper, which is not always the case with paints, especially after they dry. Also, the unpredictable nature of water added to paints throws a whole other variable into the mix that can dramatically affect the hues that result. 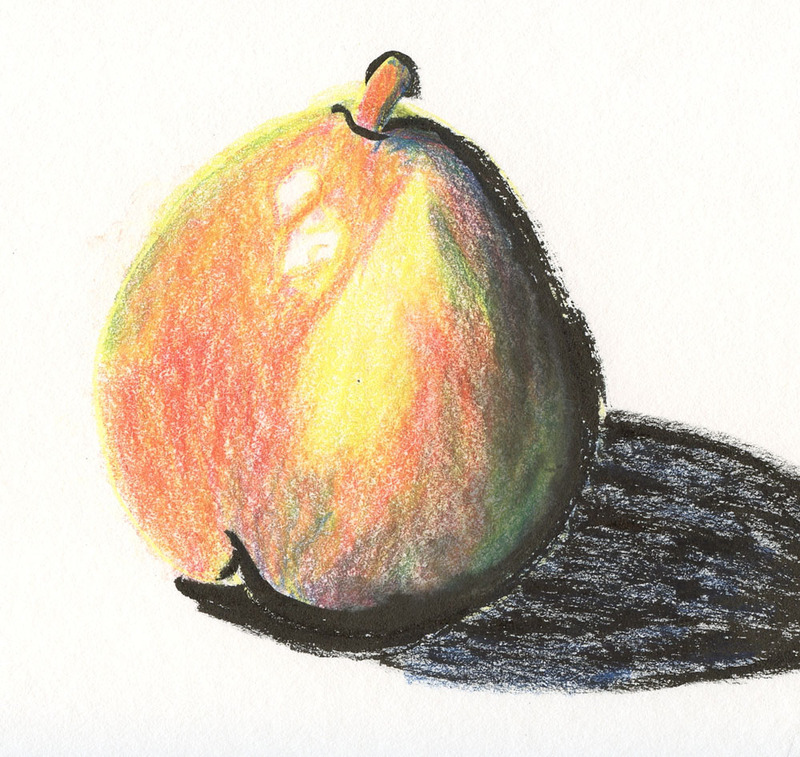 In any case, I feel like I’m learning a lot more about color mixing through these small studies in pencil than I ever did trying to use paint. When thinking of relaxing places to go a week before Christmas, Pacific Place isn’t what springs to mind – unless you’re sketching instead of shopping. Without a shopping list, Pacific Place seemed downright mellow this morning when I met up with Urban Sketchers Seattle. It wasn’t as heavily decorated as in previous years, which was a disappointment to some, but I had a different goal. I know I said I wasn’t going in for self-competitive Santa sketching this year, but Pacific Place’s St. Nick is a favorite because of the uncommon viewpoint. The retail facility’s open structure makes its multiple levels visible from other floors, so I’ve always had fun sketching Santa from the floor above (you can see my sketches from last year, 2014 and 2012). 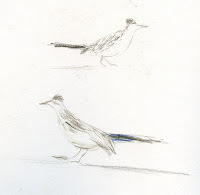 I was going to continue my own tradition and sketch him again from the same place, but then I spotted a different location – directly overhead. I couldn’t hear what they discussed, but I saw at least one well-prepared boy present Santa with a written list of things he wants. A little later I walked to the opposite side of the mall to catch the long line of people waiting for Santa. 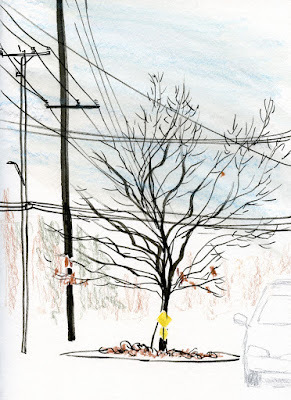 As I sketched, I thought about the tough job of his hard-working helpers. They have to coax and cajole young kids to smile or distract them long enough to snap a photo before they realize they’re sitting in the lap of some bearded stranger. Still, I saw lots of babies and toddlers take their turns bawling. 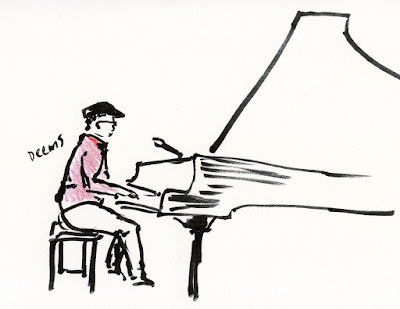 I was on my way to the sketchbook throw-down when I saw that the lunchtime entertainment was local jazz pianist Deems Tsutakawa, familiar from the many years he has performed at Seattle’s Obon festival. I only had five minutes, but that was all I needed. 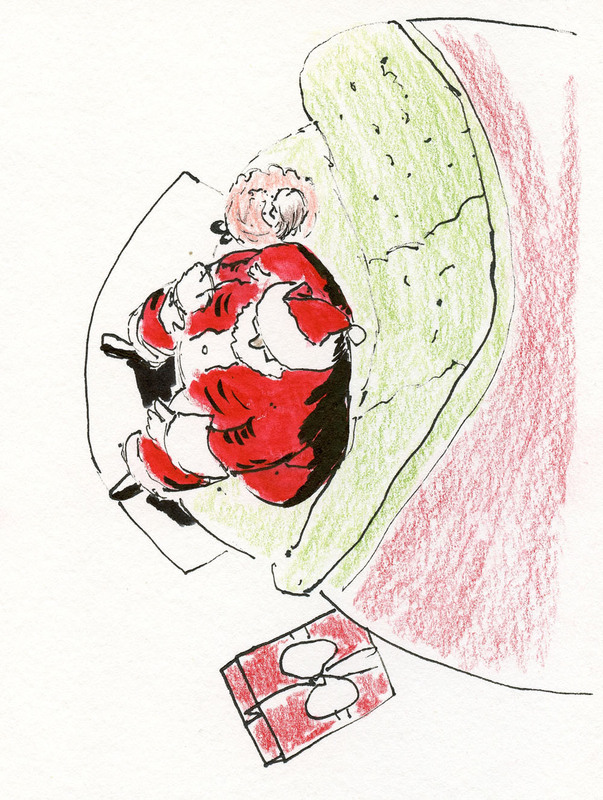 After sketching a record-breaking number of Santas last year – four! Count ‘em – four! – I decided not to participate in self-competitive Santa sketching this year. I knew it would be difficult to top my personal best, so it would be better to quit while I was ahead. That said, with only a week until Christmas and no Santa sketches, I was missing some holiday spirit. 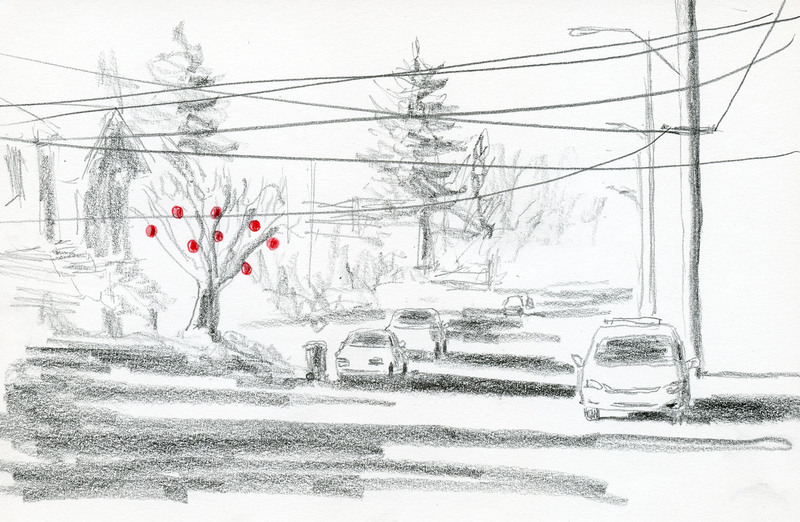 Despite knowing that the mall would be mobbed, I hopped into my car yesterday afternoon and headed for Northgate. Traffic on the streets and in the mall was heavy, but the real crowd was right in front of Santa’s station. 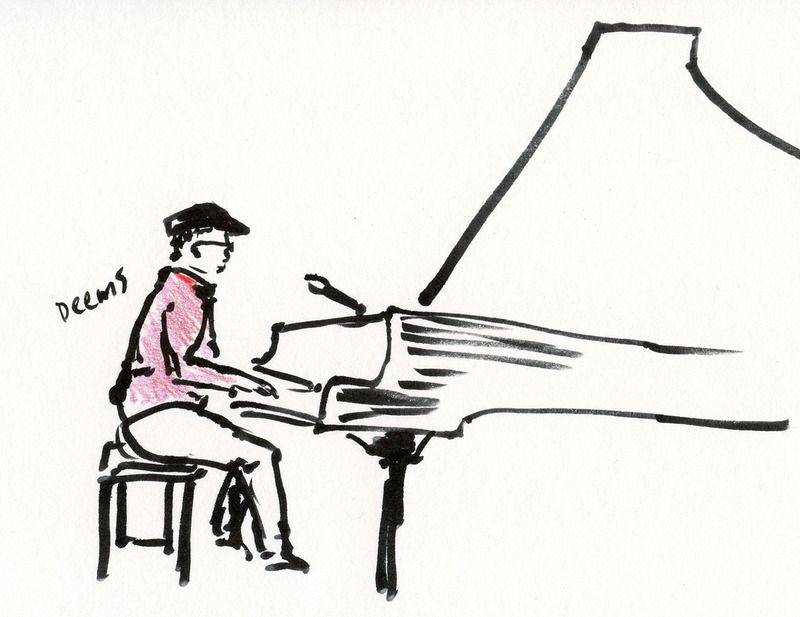 A couple of years ago I sketched him on a slow morning, and he didn’t have any customers. Last year he was a little busier, but not like yesterday – he had a line of kids waiting. 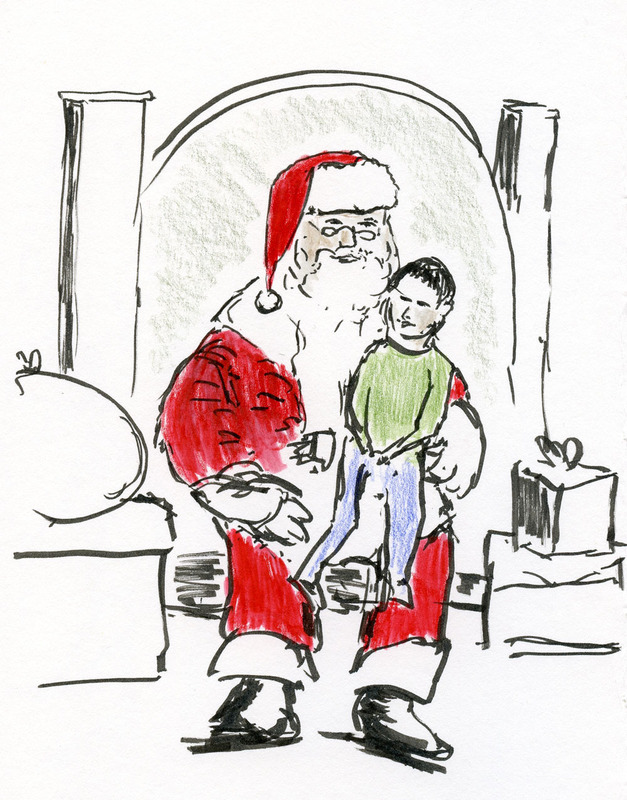 By “he,” I mean the same Santa – this was the third year I’ve sketched this truly jolly man at Northgate. 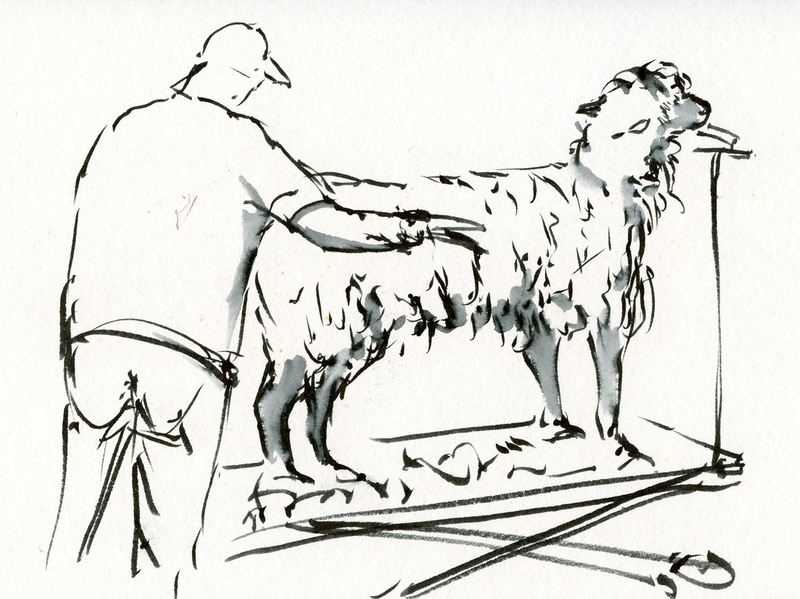 At less busy times, I’ve shown him my sketches, so he remembered me, nodding in acknowledgment when he caught my eye. It’s always a good idea to show Santa I still believe in him – at least while I’m sketching.